A while back, I had a dinner party disaster. My main course, shrimp cooked in banana leaves, was beautiful in every stage of preparation, delectable, tempting until it hit everyones' mouth and then p-tooey! It was just plain horrible. Absaltootin' inedible garbage. Bad, bad, bad. I was ashamed. No one likes to see their wonderful dinner party ruined by naughty shrimp. The only thing that saved me that night was the fact that Indian dinners have many, many, many, courses and so there was plenty of other things to eat. Even so, I was understandably reluctant to deal with the little buggers again. I was done with shrimp. My standby favorite dinner party entree treat had let me down. The shrimp trust bond was broken. Well, a few weeks passed and those shrimp just wouldn't leave me alone. They worked on me. They got on my last nerve.Those damn shrimp, I just couldn't quit them. So there I was, doing another dinner party. I recalled the same guests. I told them the main dish would be shrimp again and they were understandably... reluctant one might say. I promised them that I wouldn't be giving them an encore. I'd retired my banana leaves. I was going to be making an entirely new shrimp dish. I would turn over a new leaf and it wouldn't be a banana leaf. 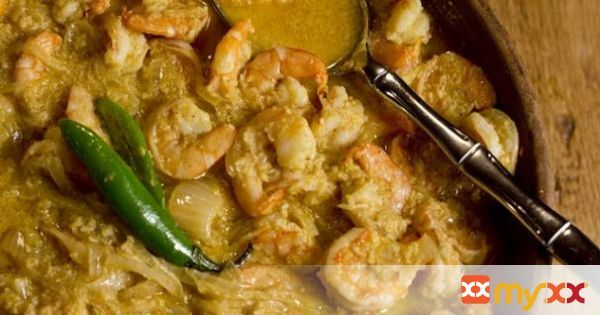 I planned on making a simple and basic Kerala dish, a Shrimp Thiyal. The dish is great because it can be prepped ahead of time and once that work is done, like most shrimp dishes, it cooks quickly. What I came up with was shrimp redemption in under an hour. I was vindicated. My guests who before had been worried about further shrimpy adventures relaxed. In a flash all the shrimp had vanished... and not down the garbage can. Served with a great rice dish and a couple of vegetable dishes, dinner was a hit. 1. Shell and devein 2 lbs of shrimp and set them aside. 2. Dissolve 1/2 tsp of tamarind concentrate in 2 Tbs of hot water and set it aside. 6. Stir it around until the coconut turns a toasty brown. 7. Place the onion coconut mixture in a food processor, spice grinder or blender. 8. Add a tiny bit of water and grind the whole thing into a paste. 10. Wipe the skillet or pan clean. 14. Stir the onion around until it softens. 23. Mix it all together, turn the heat down and add in the shrimp. 24. Cook for 5 minutes or so. 25. Add in the coconut and tamarind mixture and simmer for another 5 minutes or so until the shrimp turns color. 26. Take the shrimp off the heat. 33. When the mustard seeds start to pop, pour everything into the pan of shrimp, stir it all together.